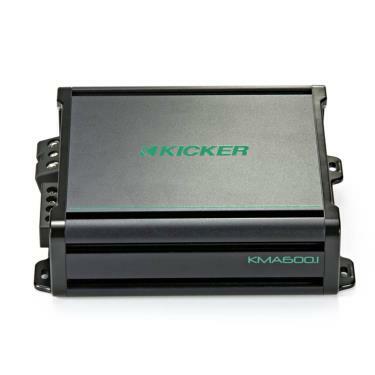 Get KICKER KM Marine Amplifier power on the water! These four super-flexible marine amps are perfect for your boat and your wallet! Purpose-built for your boat, every KM amp comes complete with marine-grade speaker terminals, stainless-steel screws, conformal-coated circuit boards and ABYC/NMMA-compliant power connections. Dialing in your sound is easy with KM amps. Variable 12dB crossovers are built in, plus a 24dB subsonic filter is also included on the KMA600.1 mono amplifier, and Amp 3 of the KMA450.6. The amplifiers are also equipped with the KickEQ™ variable 12dB bass boost! KICKER created the KMA450.6 to power up to three independent full-range zones! This six-channel, 450-watt amp provides an easy way to get the perfect volume levels on (or off) the deck, in the water, or inside the cabin. Control the volume of one zone with the receiver. Another zone is controlled with the included full-range volume knob, which can be mounted on (or under) nearly any flat surface. Experience the perfect way to get bass on your boat! A mighty Class-D power plant, 12dB crossover and subsonic filter all help you dial in the best sound. Use the remote level control to adjust the bass right from the dash and connect the full-range RCA outputs to expand your system! This KM-Series amplifier delivers as much as 600 watts into one channel.